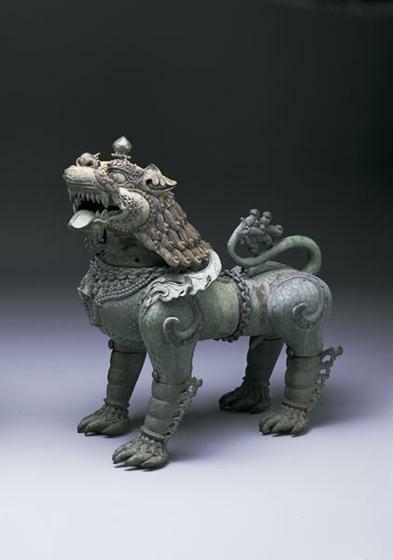 This snarling, ferocious guardian lion, one of a pair, originally stood watch over the entrance to a Buddhist temple in Nepal [1997.139.1]. The male lion was on the right and the female on the left. The lions are a fine example of the masterly bronze casting employed by the Newar people in the valley of Kathmandu, the capital of Nepal. 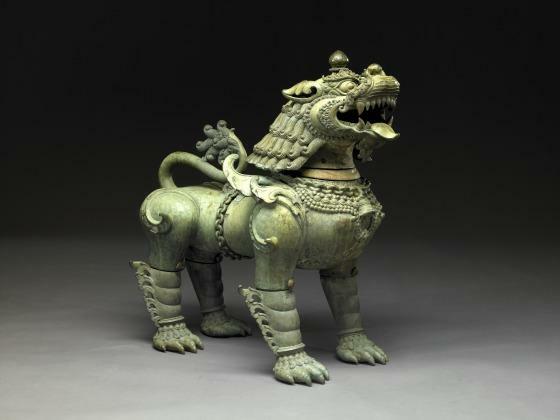 Such ferocious guardian images are common in Buddhist art from the Himalayas to China, where they are believed to protect dharma, the Buddhist teaching and law. The lions are inscribed with a date that translates to 1815. Label text, Anne Bromberg, 2003.